(Quin Hillyer, Liberty Headlines) After complaints from conservative movement leaders about U.S. Senate inactivity, the Senate is moving resolutely this week to confirm a series of President Trump’s judicial nominees, including one that Democrats had tried to block because she dared to express faithful Catholicism. In all, the Senate is expected to confirm five nominees either this week or very early next week, and the Judiciary Committee next week is expected to approve five others that then will be sent to the full Senate for confirmation. Of the first five either already or soon to be confirmed by the full Senate, four are nominees to powerful circuit appeals courts. Two of those five already have been confirmed as of this writing. One is Trevor McFadden, approved for a district court judgeship in Washington D.C. 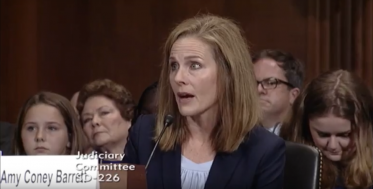 The other is the one attacked for her Catholicism, Notre Dame Law Professor Amy Coney Barrett, who now will join the Seventh Circuit Court of Appeals, which oversees cases in Illinois, Indiana and Wisconsin. Feinstein was hardly the only Democrat to make an issue of Barrett’s faith, as if traditionalist faith is somehow a disqualification for office. Senators Sheldon Whitehouse of Rhode Island, Richard Durbin of Illinois, Al Franken of Minnesota (less directly), and Mazie Hirono of Hawaii specifically worried about Barrett’s faith-based values, with Hirono repeatedly asserting to Barrett that “what you believe the role of religion was” seemed to run afoul of some supposed standard of judging. All of these questions stemmed largely from a law review article Barrett wrote years ago in which she said that if, in a rare case, a judge feels something in a case somehow disallows her from ruling impartially because of her faith, then the judge might need to recuse herself from that case – which, of course, is just the opposite of somehow allowing a faith conflict to unfairly affect her judging. After the smoke cleared, though, the Senate finally confirmed Barrett, a professor with a reputation for brilliance, in a 55-43 vote on Tuesday evening. After Larsen (presumably) is confirmed, the Senate is expected to approve Colorado Supreme Court Justice Allison Eid and Penn State law professor Stephanos Bibas to the 10th and 3rd circuits, respectively. The confirmations earned praise and celebrations not just from conservatives but also from liberal-leaning Catholic leaders (and of course conservative ones, too) who had been stunned and upset by the Democrats’ line of questioning. Meanwhile, Senate Majority Leader Mitch McConnell of Kentucky, who had come under fire from conservatives for not advancing judicial nominees quickly enough, had said earlier in the week that he was proud to move the nominees forward. “By confirming these nominees, we can take a big step toward restoring our nation’s courts to their proper role: interpreting and applying the law based on what it actually says, not what a judge wishes it might say,” he explained. Conservatives repeatedly have credited McConnell for his leadership in keeping a Supreme Court seat open during the entire election year of 2016, rather than let then-President Barack Obama fill it. The result was that President Trump was able to appoint the highly regarded Neil Gorsuch to the nation’s top court.